Jimmie Rodgers in his most published studio portrait, circa 1927. He was America’s Blue Yodeler, the Singing Brakeman, and the Father of Country Music. He was Jimmie Rodgers. From a humble upbringing, he went on to have a profound impact on the music and culture of the Western world. Those counted among his devotees spread far and wide across the globe, his influence stretching from contemporaries like the Mississippi Sheiks and Big Bill Broonzy, to blues artists like Howlin’ Wolf, to latter day superstars like Elvis Presley and Bob Dylan, and too many country musicians to count. Some have even gone so far as to suggest that the now legendary Robert Johnson’s guitar playing was attempt to imitate Rodgers. His work, as a whole, is a reflection of the human condition: life and death, compassion and hatred, joy and sorrow. Without a doubt, Jimmie Rodgers was among the most influential musical figures and cultural icons of the twentieth century. James Charles Rodgers was born on September 8, 1897, the sixth of seven children of railroad man Aaron Woodberry Rodgers (1855 to 1933) and his wife, the former Eliza Bozeman (1868 to 1903), a humble family hailing from Meridian, Mississippi. Although his birthplace is usually given as Meridian, Jimmie was likely born about forty miles northeast of there in his grandparents’ hometown of Geiger, Alabama—which Rodgers himself listed as his birthplace—and only began giving Meridian as his hometown to please the folks back home, who considered him a native. Some sources alternatively list Pine Springs, Mississippi as his birthplace. Jimmie’s mother died of the same disease that would eventually be his own downfall when he was but five years old, and the young boy was sent to live with a series of relatives nearby before returning home to live with his father, who had by then remarried. As a young man, Jimmie’s father found him work on the railroad, first as a water boy. Later, he became a brakeman for the New Orleans and Northeastern Railroad. In his railroad work, Rodgers learned musical styles from hobos and fellow rail workers, and picked up blues traditions from the gandy dancers. For a time, Rodgers relocated to Arizona to work for Southern Pacific, where he likely picked up some cowboy songs as well. In 1920, Jimmie married Carrie Williamson and had two children, the second of whom died in infancy. From his early youth, Rodgers was musically inclined, but he did not pursue a career in entertainment until later down the line. When he was twenty-seven years old, Jimmie contracted tuberculosis, which put his railroad career to an end. After some recuperation, Rodgers worked a variety of different jobs before deciding to focus on his passion for music and embark on a new career in entertainment. He found work in minstrel and vaudeville tent shows for a while, traveling around the South as an itinerant performer before more stable work came his way. By 1927, Jimmie Rodgers had settled in Asheville, North Carolina, finding work as a “city detective” for the local constabulary. Soon, he joined forces with a band called the Tenneva Ramblers, made up of Jack and Claude Grant and Jack Pierce. As the Jimmie Rodgers Entertainers, they played a blend of Tin Pan Alley popular music, and Appalachian hillbilly music. On April 18, 1927 Rodgers made his radio debut on Asheville’s WWNC, with a weekly spot on the fledgling station, which had only begun broadcasting that February. Things didn’t go so well at first, and the Jimmie Rodgers Entertainers’ gig with WWNC came to a close on June 13, followed by an ill-fated trip to Hendersonville. Soon, however, Rodgers’ big break was to come when he learned of recording sessions that were to take place that August in Bristol, Tennessee, organized by Ralph S. Peer for the Victor Talking Machine Company following the huge success of Vernon Dalhart’s recordings. He telephoned Peer, hoping to record with his band, and Peer arranged for an audition. 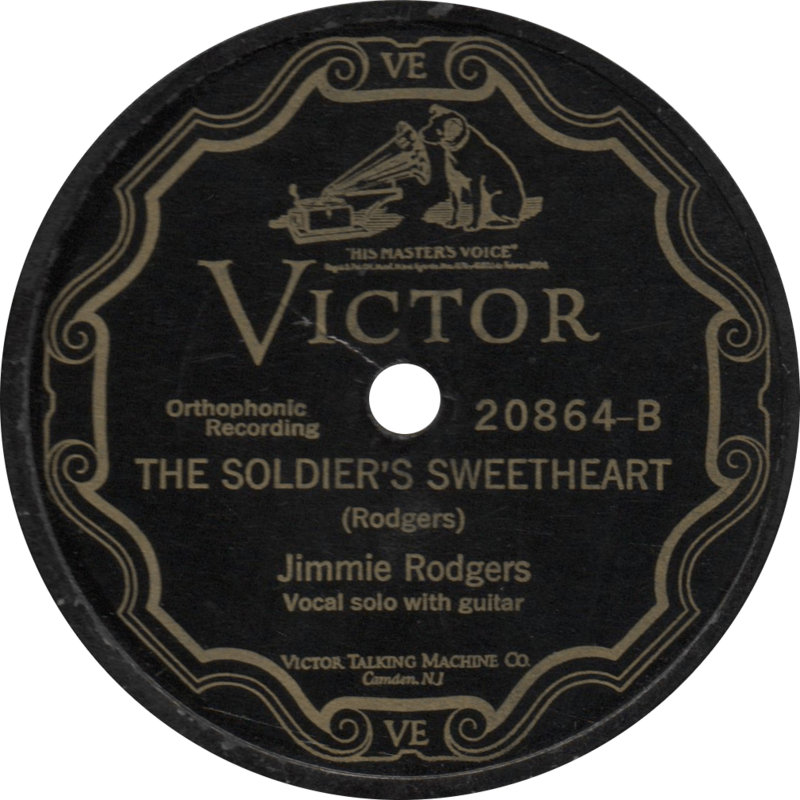 Jimmie Rodger’s first recording, The Soldier’s Sweetheart, recorded August 4, 1927. Jimmie Rodgers’ audition was fruitful, and he was scheduled to make his first recordings with his Entertainers in Bristol at 2:00 PM on Wednesday, August 4, 1927, but a disagreement arose, the details of which are not entirely certain to this day, and the band took off, leaving Jimmie alone with nothing with his guitar. He made only two recordings in Bristol, “The Soldier’s Sweetheart”, his own original composition, and “Sleep Baby Sleep”, an old standard yodeling song which had been recorded as early as 1897 (Jimmie’s birth year) by George P. Watson. Jimmie was paid one-hundred dollars for his participation in the session. The Tenneva Ramblers recorded without Rodgers later in the same day. 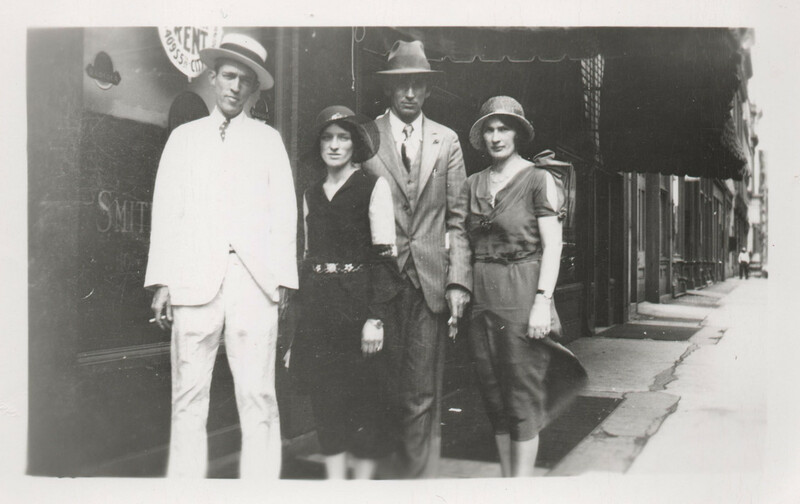 Jimmie Rodgers with the Carter Family on Main Street in Louisville, KY, June 10, 1931. Both songs Rodgers recorded in Bristol were released in October or November of ’27 on Victor 20864, Jimmie’s first record. It proved to be an immediate success, such a success in fact that no more than a month after its release, Jimmie traveled to Victor’s headquarters in Camden, New Jersey for his second session. On November 30, 1927, he recorded four songs, Andrew Jenkins’ “Ben Dewberry’s Final Run”, based on the folk legend of Casey Jones, the old standard “Mother Was a Lady” (originally issued as “If Brother Jack Were Here”), his first “Blue Yodel”, which later became known as “‘T’ for Texas”, and Kelly Harrell’s “Away Out On the Mountain”. The latter two titles were issued as Rodgers’ second disc and became one of his biggest hits, reportedly selling over 500,000 copies, and cementing his place in history as America’s Blue Yodeler. It was so popular in fact, that fox trot instrumental versions of both sides were made by Nat Shilkret and the Victor Orchestra. It has been ventured, probably accurately, that Jimmie Rodgers’ Blue Yodel songs were the progenitor of the yodeling that dominated country music until the 1950s, though he was not the first rural performer to yodel on records. 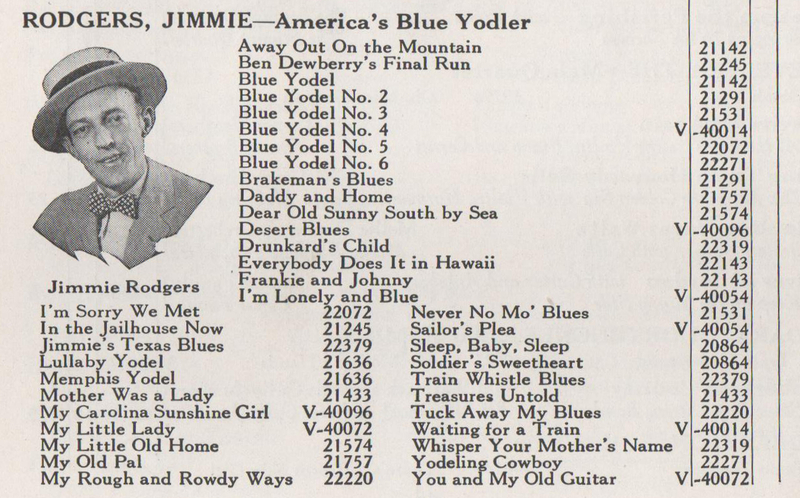 Jimmie Rodger’s first Blue Yodel (T for Texas), recorded November 30, 1927. The smash success of “Blue Yodel” left other record companies scrambling to find cover artists to compete with Jimmie’s popular Victor records, and many budding artists were inspired by Rodgers to launch their own careers in his image. Some of the imitators that sprang up to fit the bill were studio men like Frankie Marvin, brother of popular ukulele ace Johnny Marvin, but many new talents also rose, inspired by Rodgers to become blue yodelers, including the likes of Bill Cox, Cliff Carlisle, Jimmie Davis, best known as the author of “You Are My Sunshine” and governor of Louisiana from 1944 to ’48 and ’60 to ’64, and Gene Autry, who found his greatest fame as a singing cowboy later on. A block in a 1930 Victor Records catalog dedicated to Rodgers, a testament to his popularity. Over the next six years, Rodgers recorded prolifically, waxing one-hundred-eleven sides; many proved to be hits, a few were duds. His repertoire ranged in topic from sentimental ballads about the South (e.g. “Dear Old Sunny South By the Sea”), girls (“My Little Lady”), and home (“Daddy and Home”) to old standards (“Frankie and Johnny”, “Rock All Our Babies to Sleep”) to humorous novelties (“Desert Blues”), and the rough and rowdy songs of railroad life, gambling, and rounders for which became best known, though he was by no means limited to those topics. He wrote most of his songs himself, frequently assisted by his sister-in law Elsie McWilliams, with whom he worked in his minstrel show days. As Rodgers toured around the United States, making many recordings on location, he was often accompanied by local bands, such as Bob Sawyer’s Jazz Band in Hollywood. Ultimately, Rodgers went from making pittance in his earlier days to bringing in over 2,000 dollars a month in royalties on his records and compositions. Jimmie Rodgers enjoyed his greatest success in the late 1920s. Despite the downturn in economic conditions, times continued to roar for Rodgers. At the height of his career, he acquired two custom guitars, the first made by Weymann and the second by Martin, both featuring his name emblazoned across the frets. The Martin also had “Blue” across the top of the headstock, and “Yodel” beneath it, positioned vertically. In 1929, Jimmie also gave an Oscar Schmidt guitar to fan and imitator Bill Bruner, who filled in for him in concert appearances from time to time, when Jimmie was to ill to appear on stage himself. Bruner later passed that instrument on to Hank Snow by way of his son Jimmie Rodgers Snow in 1953. As one of the most popular recording artists in the nation, Jimmie used some of his royalties to purchase a plot of land on a hill in Kerrville, Texas, a location he chose for the fresh Hill Country air and the proximity to a tuberculosis sanatorium, and built a large manor, dubbed Blue Yodeler’s Paradise, that would be home for the Rodgers family. 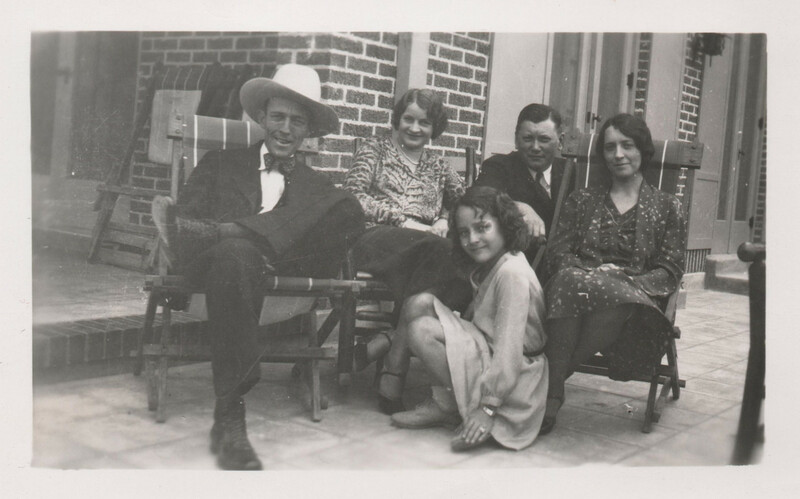 Jimmie Rodgers and family (wife Carrie and daughter Anita) with Ralph Peer and wife at Blue Yodeler’s Paradise in Kerrville. Circa 1930. In 1929, Jimmie traveled to Hollywood to make his only filmed appearance in the Columbia-Victor Gem sound film The Singing Brakeman, singing his “Waiting for a Train”, “Daddy and Home”, and “Blue Yodel”. It was released early in 1930. Not too long after he appeared in that film, in July of 1930, Jimmie cut several memorable sides in Hollywood, including his famous “Blue Yodel No. 8”, better known as “Mule Skinner Blues”, and “Blue Yodel No. 9” with Louis and Lil Armstrong on trumpet and piano. Armstrong was in California at the time playing at Sebastian’s New Cotton Club in Los Angeles. That constituted one of a number of racially integrated sessions in which Rodgers participated. In 1931, he made recordings with accompaniment by Earl McDonald’s Louisville Jug Band on “My Good Gal’s Gone”, and again later in the same year by blues guitarist Clifford Gibson on an unissued take of “Let Me Be Your Side Track” . Those good times were not to last, however, as hard times overtook the Rodgers when the effects of the Great Depression began to set in, and Jimmie’s relentless touring and rambling spirit exacerbated his TB. Early in the 1930s, despite his poor health, Jimmie embarked on a tour for a Red Cross charity drive with Will Rogers, who came to refer to him as “his long lost son.” In 1932, Jimmie recorded with old-time fiddle legend Clayton McMichen, with whom he collaborated on the classic “Peach Picking Time Down in Georgia”. The same year also saw him sell his grand estate in Kerrville to relocate to San Antonio, where he hosted a radio program, taking up residence in a suite in the Gunter Hotel. Jimmie Rodgers’ final recording, Years Ago, recorded May 24, 1933. 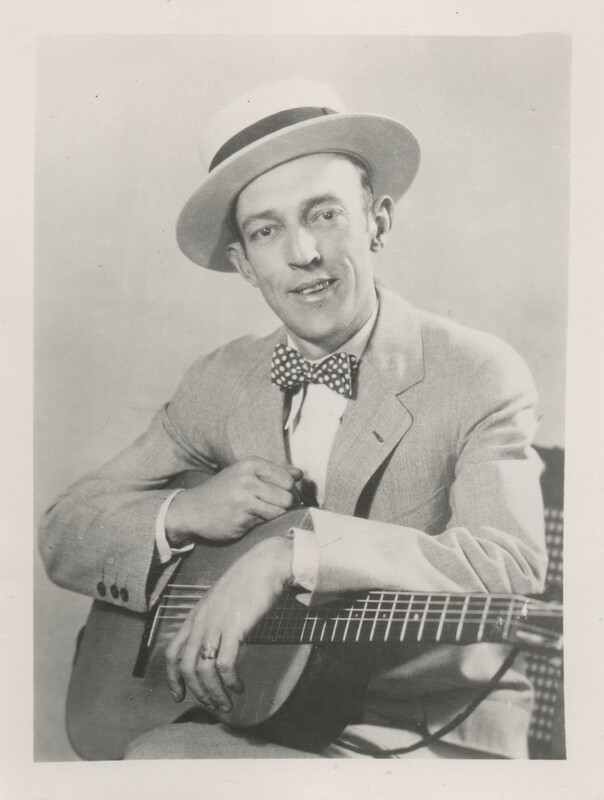 In May of 1933, near the worst part of the Great Depression, Jimmie Rodgers traveled to New York City for the last time and recorded twelve sides between the 17th and 24th of that month, including his final Blue Yodel song, “The Women Make a Fool Out of Me”. In those four sessions, Rodgers was so weak from his illness that he had to rest on a cot in-between cuts, and was accompanied by studio men. Nevertheless, Jimmie managed to muster a voice that was still surprisingly strong, and demonstrated quite a wide vocal range on his last Blue Yodel. 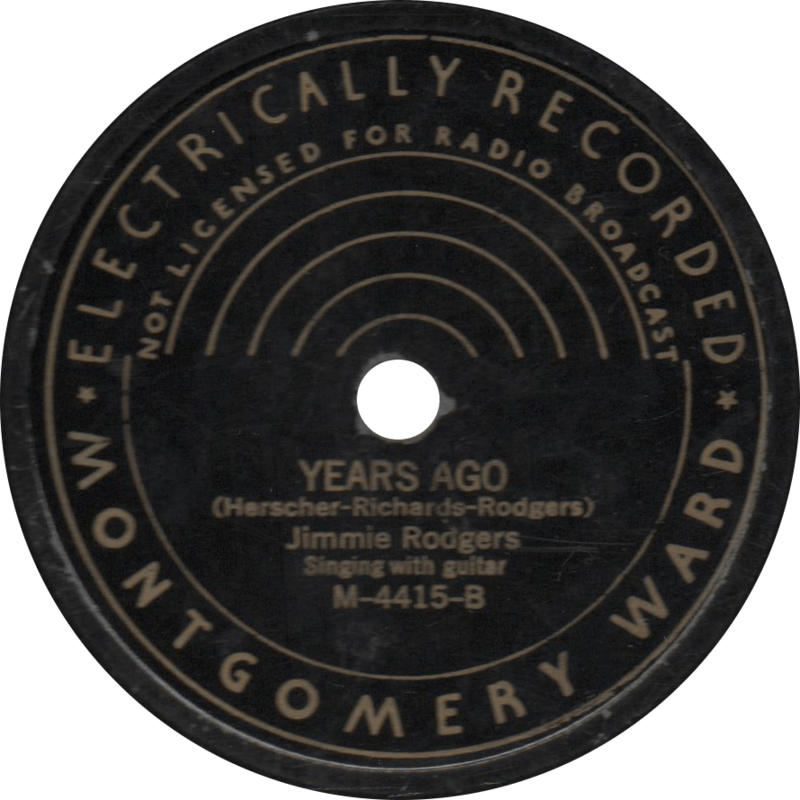 At the end of his session on the 24th, Jimmie Rodgers summoned up the strength to accompany himself on guitar for “Years Ago”, which would be his final recording. 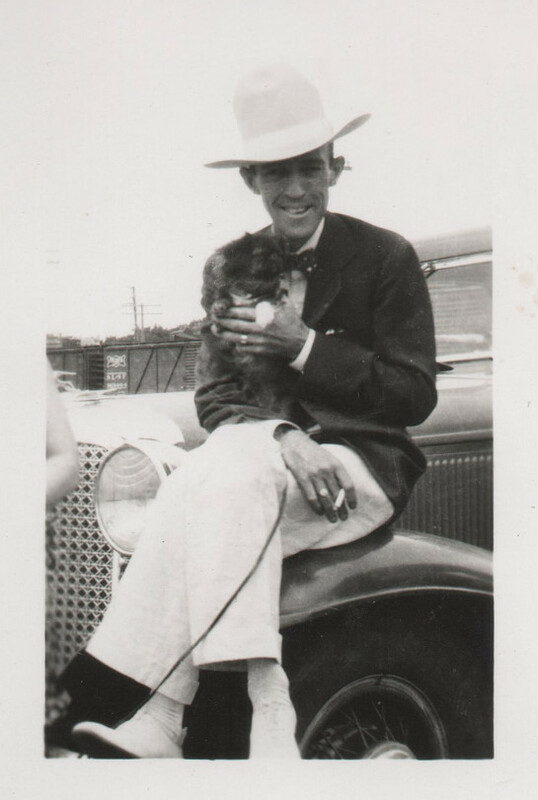 A rarely seen snapshot of Rodgers in his last years, atop a ’31 Chrysler and holding a puppy. Only two days after his final session, on May 26, 1933, Jimmie Rodgers finally succumbed to his tuberculosis in his room in the Taft Hotel in Manhattan, dying of a pulmonary hemorrhage at the age of thirty-five. 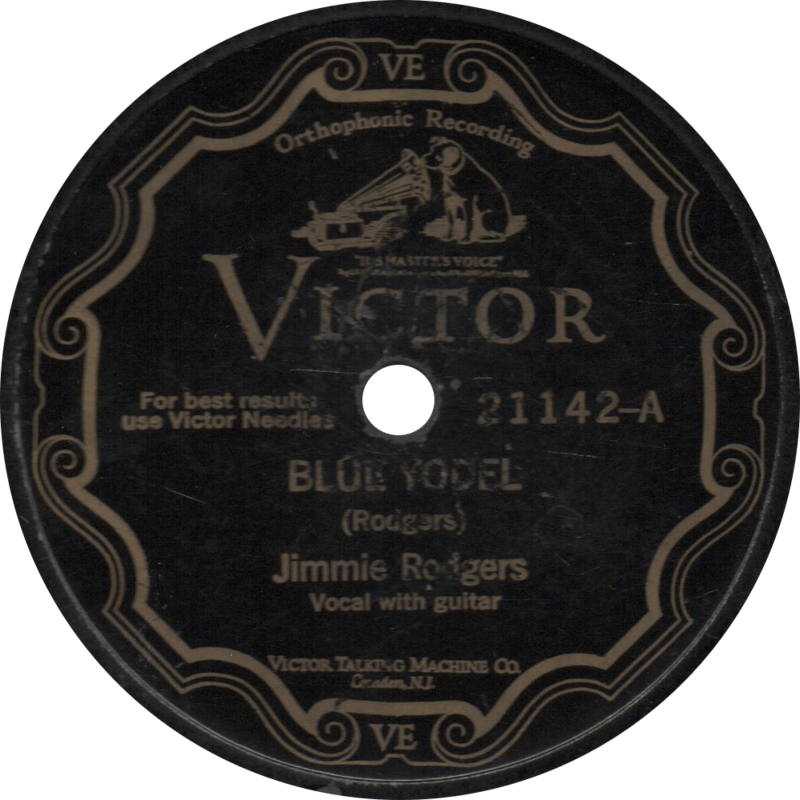 At the time of his death, he was Victor’s top selling artist, and when RCA Victor rolled out their Bluebird budget label in May of 1933, the first release was a Jimmie Rodgers reissue. His passing was felt around the world, and was eulogized in a number of tribute songs by the many musicians that he influenced, perhaps the most notable of which were Bob Miller’s “The Life of Jimmie Rodgers” and “The Death of Jimmie Rodgers”, sung by such devotees as Gene Autry and Bradley Kincaid. Folios of Rodgers’ songs remained in print for decades, and his records were reissued until the stampers wore out. In 1936, Rodgers’ widow, the former Carrie Williamson was approached by a fan of Jimmie’s: Ernest Tubb, a local performer on KONO in San Antonio. The two forged a friendship, and she loaned him her late husband’s famous Martin guitar, which he played on his first records. Carrie herself recorded two sides for Bluebird in 1936 and ’37 as Mrs. Jimmie Rodgers, making a tribute song to Jimmie, accompanied by Tubb on her husband’s guitar. Victor released several volumes of a memorial album of Jimmie Rodgers’ songs in 1949 and 1950, and in 1955, some of Jimmie’s recordings were even overdubbed with a band accompaniment by Hank Snow’s Rainbow Ranch Boys to keep the songs of the beloved Blue Yodeler up-to-date. Less than a year after his death, Jimmie’s cousin, Jesse, also entered the music industry, becoming a successful blue yodeler in his own right, and later changing the spelling of his name to “Rogers.” Jimmie Rodgers was one of the first inductees into the Country Music Hall of Fame in 1961, and was inducted into the Rock and Roll Hall of Fame in 1986 as an “Early Influence”, the first in that category. It would be difficult to overstate the impact Jimmie Rodgers made on America. His music formed the foundation of what we know as country music today, and has brightened the lives of millions for eight decades and counting. His influence held strong for many years after his death, and still continues to to this day. In his later years, Ralph Peer looked back on Jimmie’s “perennial optimism,” and referred to him as “generous to a fault.” Jimmie Rodgers has touched millions with his music, and continues to do so even today, some eighty years after his passing. This entry was posted in Spotlight and tagged 1920s, 1930s, Hillbilly, Jimmie Rodgers, Ralph Peer, Victor by R. Connor Montgomery. Bookmark the permalink.